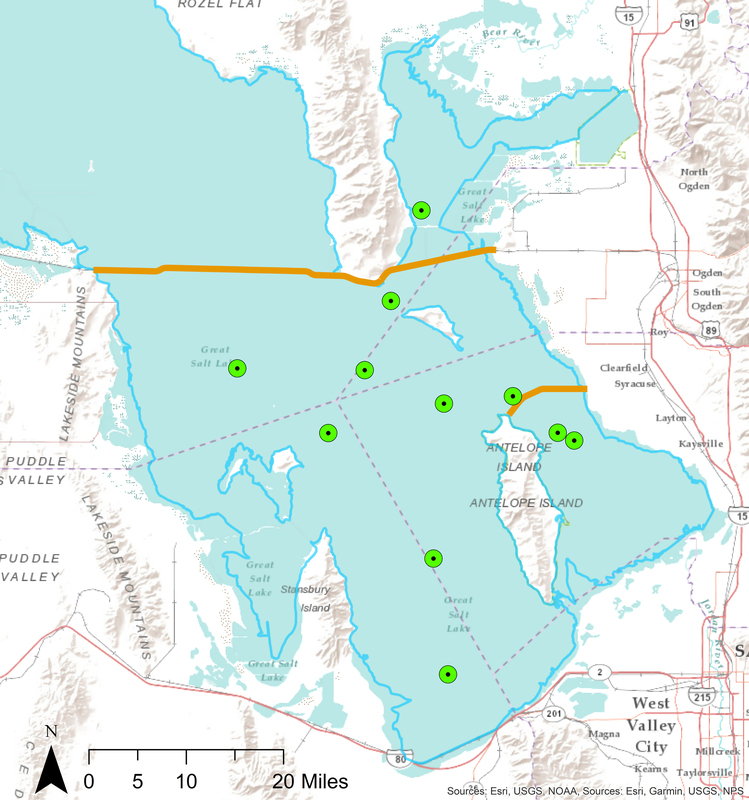 Routine water-quality data collection helps the Division of Water Quality (DWQ) take appropriate actions to protect Great Salt Lake’s (GSL) beneficial uses. DWQ’s GSL monitoring program is designed to detect potential changes in water quality conditions, support the development of numeric and narrative water quality standards, guide discharge permitting decisions, and assess beneficial use attainment in GSL. GSL water quality and brine shrimp monitoring locations. Click for larger view. Bird eggs are collected during the spring breeding season where nesting occurs along the GSL shoreline. Brine shrimp and bird egg samples are analyzed for trace metals concentrations, including mercury and selenium. Selenium concentrations from bird eggs are used to evaluate attainment of GSL’s selenium standard. Samples are collected during spring (June) and fall (October). However, site access issues due to low water levels have occasionally limited sample collection. At sites with a water depth greater than one meter (m), two samples are collected: 0.2 m from the surface and 0.5 m from the bottom. At sites with a water depth less than one meter, only one sample is collected 0.2 m from the surface. In addition to these environmental samples, field crews also collect quality assurance/quality control (QA/QC) samples including field blanks and field replicates under DWQ’s GSL monitoring quality assurance project plan to ensure high-quality data. 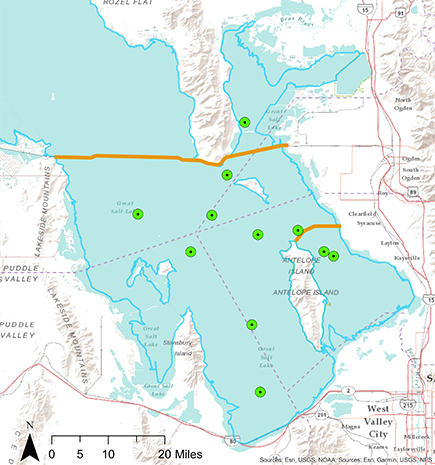 Samples are collected through a collaboration of DWQ, United States Geographical Survey (USGS), and Davis County Health Department staff. DWQ monitoring staff adhere to specific standard operating procedures (SOPs) for sampling and biota collection. 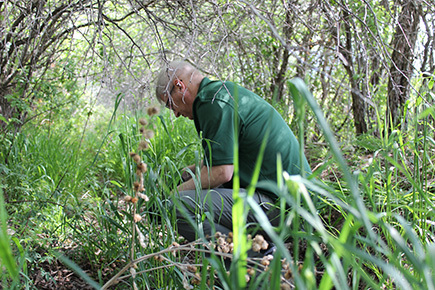 These SOPs include the sampling equipment required, cleaning protocols for equipment, sampling procedures, types of samples collected, sample locations, and documentation of field activities, including field measurements. Metals data (surface and deep layer) for three matrices: water quality, brine shrimp, and bird eggs. Water-quality map (surface and deep layer) for selected parameters, including salinity, water temperature, Secchi depth (water clarity/light penetration), total phosphorus, chlorophyll-a, and total nitrogen.